This handcrafted, wind-activated bell, with its bold tone and design, functions nicely as a welcome bell at any entrance to your home or garden. We tone our bells to unite two important ways the instrument vibrates. One is the sound of the bell itself and the other is the hollow chamber inside the bell that acts like an organ pipe. The slots on the sides of the bell are the secret to this unique coupling. The result is a rich sound with much depth and beauty. This steel bell has been coated with a handsome, durable finish, so you can enjoy it for years to come. 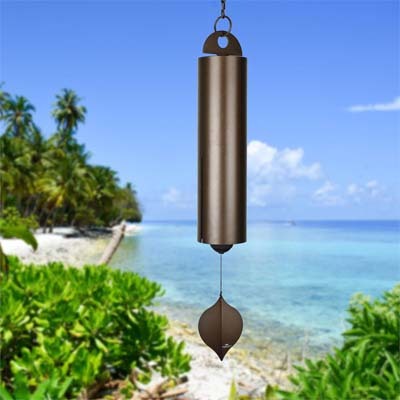 Hang your Heroic Windbell in a breezy spot and let it play in the wind.